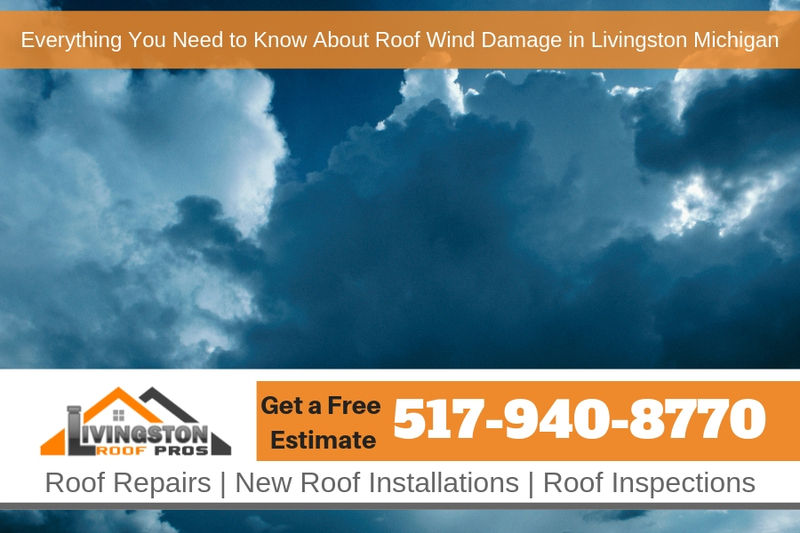 While various kinds of severe weather can cause roof damage in Livingston Michigan, wind is one of the most detrimental weather conditions to your roof. You might think that winds during severe occasions, such as hurricanes or tornadoes, are the only threat to your roof. But in reality, routine strong breezes can actually cause severe roof damage over time. That being said, continue reading to learn everything you need to know about roof wind damage! While there isn’t much you can do about the weather there are things that you can do to help minimize the damage from the weather. For instance, when you know there is a strong storm coming through the area with high winds you may remove patio furniture and other items that may be blown about that can cause damage to the items or your home. Having your roof prepared for bad weather is also a must if you want to prevent damage. Understanding how damage occurs on your roof during times of high winds or storms can give you a better approach to keep the home’s roof in better condition when a storm does hit. Typically, roof wind damage begins at the outside access points of your roof. In other words, wind damage usually accrues on the edges and corners of your roof because they aren’t as durable and protected as other areas of your roof, such as the center. When a strong breeze blows around your home, it can weaken the corners and edges of your roof while simultaneously blowing them upwards. This type of damage can be dangerous because it’s often hard to identify. So, it’s more likely to get worse over time instead of being fixed. Not only does roof wind damage occur in the form of cosmetic and durability problems, but if the damage is severe, your home’s insulation can be exposed, which causes a variety of serious problems for your home’s infrastructure, durability, and overall safety. Wind itself isn’t the only threat you have to consider. Strong winds can cause various forms of debris to fly into your roof, which could damage it. For example, what might seem like a small scratch or chip can become a serious problem over time if it’s left alone. Flying debris from wind can also cause your gutters to back up, which could cause water deposit issues and even damaged roof shingles. Since wind is uncontrollable, there isn’t really a specific number of steps you can take to ensure your roof never experiences wind damage. However, there are some things you can do to limit the amount of roof wind damage your home experiences. For example, if your area experiences an extended amount of regular or severe winds, consider inspecting your roof to ensure it’s still in good condition. This is a key element in ensuring your roof isn’t seriously damaged from wind because if you come across any damage, you can simply have it repaired before it becomes more of a problem. Whether you suspect your roof has wind damage, or you discovered damage that needs to be fixed, you should hire a local trusted contractor to fix your wind damage. Contractors are equipped with the necessary skills, experience, techniques, and materials to adequately fix your roof’s wind damage while simultaneously ensuring it’s stronger and more durable than ever before, so you hopefully don’t have to worry about future wind damage. Not only will your local contractor be able to fix your roof wind damage, but they will also be able to assess your roof’s durability and function. If your roof regularly experiences wind damage, it might be old, decayed, or just not the right type of roof for the area you live in. If you suspect there is damage to your home’s roof from wind or storms be sure to call Livingston Roof Pros today for a roof inspection. We’ll have a qualified roofing professional inspect your roof and repair any damage that may have occured. Be sure to call us today!